During Wednesday's historic State Board of Elections hearing that offered the spectacle of a former governor being grilled publicly by board members, there was a short break and Easley wandered over to where I was reading the New York Times. Before the hearing resumed I had time for one question: In hindsight, was it that good an idea for him to testify publicly? I had heard the governor's lawyers didn't want him to testify when other officials were still conducting inquiries, and I could see why. By the nature of the questions from board members, I had the distinct impression that Easley's version was not finding as much credibility as was his former ally McQueen Campbell's Monday version about flights, home repairs and payment. I didn't have my pad and pen in hand and thus couldn't record his answer, but the gist of it was that he felt, after all the stories about him and his campaign, some obligation to the people to answer questions publicly. It has been clear from news stories that he wasn't going to answer questions that News & Observer reporters have for him, and that's too bad. They've done a lot of good work on Easley's record, and to my mind their questions are probably better focused than the election board members' sometimes rambling questions. But the truth is coming out, some of it, and some of it in fits and starts, and we'll know more when the board comes to its conclusion and when other authorities complete their investigations. We've all heard the old line about legislation and sausage -- that neither should be watched in the making. But for stomach-turning details, it would be hard to beat the N.C. State Board of Elections hearings in Raleigh this week. If you've tuned in to the Web streaming or watched on TV, you know that the list of unseemly things should include political campaign finance operations. * Scores of flights to political events worth more than $87,000 were never reported on required state campaign finance disclosure forms by former Gov. Mike Easley's political campaign in 2000 and 2004. The pilot, McQueen Campbell, essentially gave the flights to Easley. Easley later named him to the N.C. State University board of trustees. Campbell helped the Easleys in several ways, including helping Mary Easley get a job at N.C. State. It was a cozy arrangement. * The campaign treasurer, Raleigh lawyer Dave Horne, told the board Tuesday morning that it wasn't his responsibility to find out about airplane flights the governor might have taken to make sure they were properly reported. He later testified that he did make sure airplane flights were properly reported for the flights that he knew about or helped arrange from another pilot. * When Easley needed someone to assess whether his Raleigh home -- while his family lived in the Executive Mansion -- needed repairs, he asked old friend and pilot Campbell to look at the problems and have them fixed. When Easley had yet to ask Campbell how much he owed, Campbell said he called Easley and understood the governor to instruct him to send the campaign a bill for some of those unreported flights so that they totaled up to the cost of the home repairs. They cost 11,000. * When a campaign aide balked at paying one bill and asked for documentation, she said, Easley called to tell her it was okay and to just pay the bill. Then the kicker: Easley filed a claim for the damage with his insurance company and collected something like $5,400. Campbell got paid with campaign money, not insurance money, but here's the thing: At that time, it wasn't even illegal to convert campaign money to pay for personal things -- as long as the candidate reported the money as income. Uh, oh. * Campaign contributors such as Lanny Wilson and Nick Garrett told how they had helped raise a lot of money for the Democratic Party and believed it was headed right for the Easley campaign. Wilson also told the Easley campaign they should tap developer Gary Allen for a $50,000 contribution to the Democratic Party that would make its way to the Easley campaign. In exchange, Allen wanted reappointment to the N.C. Wildlife Commission and a state environmental permit for a boat ramp on the coast. That's just the way it happened. Can you smell the aroma? * In questioning this morning it was clear that Board of Elections members believe that the Easley campaign had cooked up a plan to run big campaign contributions through the state Democratic Party or the Democratic Governors Association. There's a $4,000 limit on contributions to individual campaigns, but not on political party campaign contributions to political campaigns. * Campaign Treasurer Dave Horne couldn't recollect such a scheme. He also told Board Chairman Larry Leake that he couldn't understand why anyone would want to avoid having a controversial contributor's name on Easley's campaign disclosure reports by first donating the money to the Democratic Party in the foreknowledge that it would wind up in Easley campaign hands. I'm guess Horne was the only one in the room who couldn't understand that scheme -- or who would say they didn't understand it. Politics is a contact sport in many ways, and it takes more than a large checkbook and a strong stomach. But what's troubling about the elections board hearings so far is that they show a disregard for the letter and spirit of the law by a campaign and a candidate who first came to political prominence as a crime-busting prosecutor with a squeaky-clean image. Worse yet, they draw a picture of a man who would go to extraordinary lengths to avoid having to spend money for items that everyone else in the world has to find a way to pay for. I don't know if that set of circumstances involving the home repairs and the insurance claim he filed will put him in a courtroom, but it's one of the seamiest stories I've ever heard told about a North Carolina governor going back more than 40 years of covering N.C. politics. This is exactly what Charlotte Mayor Pat McCrory was talking about when he referred to the culture of corruption in Raleigh. It seems to pervade everything -- personal dealings, party fund-raising, favor-taking and favor-granting and, when investigators come calling, a whole lot of smart people suddenly unable to remember certain details. It reminds me of what Sen. Sam Ervin said in the Watergate hearings 35 or so years ago: A good forgettery is better than a good memory. Sheesh. They broke ground Thursday morning on the rolling land that once was a dairy farm that supplied food to Dorothea Dix Hospital in Raleigh -- but which will soon be the home of a new research library named for former Gov. James B. Hunt Jr. It's to be quite a place -- perhaps the best feature yet of the highly successful Centennial Campus on the N.C. State University campus, launched 25 years ago as Hunt's second term was coming to a close. As Hunt told the story Friday morning, Raleigh Mayor Avery Upchurch came to his office to ask that the state give the land for a new housing development. But Hunt had had another idea, one sometimes ridiculed back in 1984: Give it to N.C. State University for a new kind of business-research-residential-student-government office complex that would be envy of the world. Pretty audacious stuff -- but it has reshaped N.C. State University's reputation, giving it a cutting-edge sharpness about producing the processes that entrepreneurs will use to produce jobs of the future and creating a sort of global envy about what they've got going on the Centennial Campus. Read about it in Jay Price's story here. At this morning's festivities, former UNC Charlotte Chancellor James Woodward, now the chancellor for the interim at NCSU while a search proceeds for a new chancellor, gave credit to Hunt for the transformative idea: "No Jim Hunt, no Centennial Campus," he said. Woodward also gave a warm introduction to a series of speakers, including a glowing tribute to UNC System President Erskine Bowles. Bowles got up, strode to the podium and told the assembly something like, "You've just witnessed Erskine Bowles' Rule One of Politics: Always be introduced by someone you appointed to high office." Politics and public policy get most of the attention on This Old State, but I've got to take notice of notable contributions about the culture of the place when it arrives. 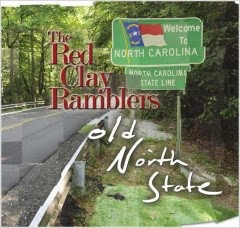 And just the other day came a note about the Red Clay Rambler's latest CD of N.C.-centric songs. It's called "Old North State," and like the Rambler's previous works, it's a toe-tappin', finger-poppin' delight. One reason is the band's cast of musical mavens, including Clay Buckner, Jack Herrick, Chris Frank, Rick Good, Bland Simpson and Rob Ladd, not to mention the backup vocalists. They're all superb musicians with a flair for the kinds of funny send-ups, haunting melodies, rural skits and pulse-quickening pieces they play. Go see one of the performances of the Ramblers' big band, as pianist Bland Simpson calls it when everyone's on stage at once, and you'll see more than two dozen instruments played during the course of the evening. I once saw the drummer tapping out a rhythm on the strings of the fiddle while the fiddler was busy sawing away on a melody. Where do these guys get this stuff? Well, from their imagination, from nature, from the state's history, from previously penned lyrics and from their own creativity. Simpson, for example, is head of the creative writing program at UNC Chapel Hill, has written books about the state's coastal and sound regions, hosted a public television program about the coastal area and collaborated with his Rambler colleagues and former Charlotte Observer cartoonist Doug Marlette and Pulitzer Prize winner, now deceased, on the musical "Kudzu." Even the Ramblers' name hearkens to another time in N.C. history: Charlie Poole and the North Carolina Ramblers made roots music popular in the 1920s with such songs as "Don't Let Your Deal Go Down." It's often said that the North Carolina Ramblers and Poole paved the way for such popular acts as Bill Monroe and the Bluegrass Boys, and the country music of Hank Williams. The original Ramblers have inspired other bands with the name Ramblers, too. In the new CD, which Simpson calls "statriotic" (a blend of state and patriotic, I do believe) and confesses that the band has wrapped itself in the flag of North Carolina, there are salutes to big band leader Kay Kyser, jazz musician Thelonious Monk, composer Louis Jordan, author Thomas Wolfe, and Charlie Poole's original Ramblers. It also features a Jack Herrick orchestration, first performed with the Red Clay Ramblers and the North Carolina Symphony in 2007, called "The Old North State Rambler." It includes some fiddle tunes as well as "The Old North State," the state song written in 1835 by Judge William Gaston. I'm partial to "The North Carolina State Toast and Breakdown," which combines the toast (Here's to the Land of the Long Leaf Pine, the Summer Land Where the Son Doth Shine….." and an old Arthur Smith and the Dixieliners' fiddle tune called the "North Carolina Breakdown." As a historical note, the Ramblers point out, the state toast was first delivered not in North Carolina, but in Richmond, Va., in 1904 when the Rev. Walter Moore, a Charlotte native, closed his speech to the North Carolina Society of Richmond with a recitation of Leonora Martin's toast about this old state. When we're in Virginia and seated at table, we try always to toast the Land of the Long Leaf Pine. Find out more at www.redclayramblers.com. Political analyst and consultant John Davis always has an interesting take on North Carolina politics. Davis cut his political eyeteeth in Mississippi before settling in this state, and his savvy analysis of state legislative and other races has always brimmed with insight. Davis took note the other day that fromer Raleigh mayor Tom Fetzer, a longtime bachelor and now N.C. Republican Party chairman, married over the weekend. Davis wasn't invited, he noted, but he is giving Fetzer "a wedding gift in the form of a true story about a transformative lesson I learned from a reclusive millionaire banker in Mississippi … a lesson that may help Tom as he works to lead Republicans in North Carolina towards their goal of winning power over the state budget in 2010, as well as winning influence over reapportionment following the next census." Fetzer’s experience as a candidate, party activist and consultant gives him the ideal skill set for political combat. As the first GOP mayor of Raleigh in the 20th Century, he built a winning coalition that led to three wins and raised a record-breaking $500,000 for his reelection. Another vital change underway at the North Carolina GOP is a renewed commitment to unity evidenced by the rallying theme for the 2010 elections, “One Team, One Goal, Victory.” A quick glance at Fetzer’s endorsements for party chairman reveals that the theme is more than PR fluff. He received the backing of the who’s who from the Helms, Holshouser and Martin eras. Almost every former party chair along with current and former statewide elected officials worked together to help elect him chairman. However, the final and most difficult change for North Carolina Republicans has yet to be made, and that is the need for crafting their message for the 2010 electorate. Many are saying that 2010 is trending Republican-friendly … a year that could be as revolutionary as 1994, the first time in the 20th Century that the GOP won a majority of the seats in a legislative chamber. But North Carolina is nowhere near the same state it was in 1994. Our state had only 3.6 million voters in 1994. We have 6.1 million today. In 1994 only 10.3% of North Carolina voters said they were “Liberal.”2 Today, that number is 24%.3 Now here’s the real clincher: In 1994, Democrats had a market share of 59% of North Carolina voters, compared to 33% for the Republicans and only 8% Unaffiliated. Today, Unaffiliated voters have tripled to 23%, the GOP share is about the same, and Democrats have plummeted 13 points to 46% … at the same time the number of “Liberals” has more than doubled! My wedding gift to Tom Fetzer is the transformative political lesson from a reclusive Mississippi banker, the importance of embracing past mistakes so that they are not repeated. Accepting the fact that we are not the Old South of 1994 is critical to winning in the New South in 2010. Dome today has a piece about the ongoing friendship and collaboration of UNC System President Erskine Bowles, a Democrat, and U.S. Sen. Richard Burr, a Republican, and their economic summit at N.C. Central University in Durham. The two have become friends since their bruising 2004 campaign for the U.S. Senate, when Burr beat Bowles and captured the seat being vacated by former Sen. John Edwards, the Democrat whose popularity numbers have slid over the abyss. If you watch Carolina basketball you'll sometimes see Burr sitting with Bowles in the Smith Center. The two men obviously like one another. It's good to see them working together, but it ought not surprise anyone. Bowles has a history of working across the aisle and within the complicated factions of both political parties. That's how he helped arrange a balanced budget when he was White House chief of staff in the Clinton administration. And Burr will talk your ear off when he's interested in a topic and has some thoughts about how things might work. But I can't help wishing they had talked directly with one another back during the 2004 campaign, when they might have hit on ways to give voters a better campaign that was less about money and more about issues. They came close to doing the right thing the other day, but something got in the way. After a Virginia-based independent group called Americans for Job Security began running pro-Burr ads in North Carolina, Bowles had a suggestion: Let's agree to discourage third-party independent spending campaigns in North Carolina. Bowles knows how ugly they could be; environmental and workers' groups criticized his 2002 Senate opponent, Elizabeth Dole, in negative ads that year. Bowles himself was the target of negative ads financed by national Republican interests. He wrote Burr the other week to tell him he thought outside special interests have no place in N.C. politics. How about a pledge to keep special interests out? Trouble was, Bowles didn't just send that message to Burr. His campaign sent it to the press, which is how the Burr campaign found out about it. I don't know about you, but if someone wanted me to do something, I'd want to know what it was and think about it a bit before I heard about it from a reporter. The Burr folks thought it over and made a counter-proposal: Why don't we also agree to keep the influence of big money out of our campaigns by agreeing not to make big personal contributions? Bowles is wealthy and put considerable sums in his 2002 campaign; Burr is pretty well off, though not in the same bracket as Bowles. Bowles regarded that as a rejection, but wrote back that he would accept Burr's proposal - though he had contributed an equivalent amount that had been spent in Burr's behalf by Americans for Job Security, around $600,000 or more. You guessed it: the wheels came off. Burr's campaign rejected the Bowles' campaign offer, concluding that Bowles had already violated the Burr proposal by putting money in his campaign. The matter is closed, a Burr spokesman said. We're done talking about it. Too bad. They came so close. Or did they? Both campaigns were engaging in a kind of one-upsmanship that sent the idea down the tubes. The Bowles campaign's appeal through the media appeared designed more to get publicity than results. The Burr counterproposal seemed designed to mitigate Bowles' personal financial advantage, ignoring the fact a big personal contribution would at least be disclosed and could hardly qualify as special-interest money. Bowles' response that he would agree to the deal but had made a personal contribution equal to the independent ad campaign sent the Burr folks down the slippery slope of suspicion, souring any chance of further negotiation. The Bowles campaign thought that was a sign that Burr was never serious about it in the first place. Burr's camp thought the same thing about Bowles. We'll never know. What we may end up with is another of those campaigns that make North Carolina infamous, with specials interests from somewhere else trying to tell us who we ought to put in the Senate and spending gobs trying to buy our votes. Bowles is now suggesting the candidates discourage their own political parties' senatorial campaign committees from running independent ads. Burr's campaign dismissed the suggestion as one more hollow attempt to make a deal through the news media, and anyway it was no longer listening. It's too bad these two candidates aren't talking directly, and seriously, about doing something to give North Carolina voters a better campaign. But that would take some leadership on someone's part. Either Burr or Bowles has to pick up the phone and start the conversation - person to person. It's an opportunity to lead. Will either candidate take it? Those looking for continuing signs of a brighter future for Republican candidates will find it in the latest work by a Democratic polling firm. Public Policy Polling in Raleigh does a lot of work for Democrats, but its findings have a lot of credibility among political observers across the spectrum not only because it called the election accurately last year, but also because it has been taking note of poor popularity numbers for Democrats and the increasing likelihood that Republican U.S. Sen. Richard Burr, once thought to be in some trouble for re-election next year, is in pretty fair condition because Democrats have not come up with a popular candidate who fares any better against Burr. The other day PPP found that Jessecrats in Eastern N.C. -- the Democrats who once helped Sen. Jesse Helms win and stay in office for decades -- think better of President Obama, a black man, than they do of Gov. Bev Perdue, a white woman. Our newest poll finds the GOP holding a 48-38 lead on the generic Congressional ballot and a 46-39 one on the generic legislative ballot. There are two key reasons for the early Republican lean: independents are leaning toward them and they're more unified than the Democrats are. For Congress independents prefer Republicans 37-21 and for the legislature it's 34-23. 90% of Republicans but only 76% of Democrats plan to support their party in Congressional races and for the legislature those figures are 89% and 77%. These high levels of Republican unity are becoming a constant in our polling across the country as the party's voters seem to realize they'll all have to be on the same page to avoid repeats of the disastrous 2006 and 2008 election cycles. The generic Congressional numbers aren't that important. Unless Bob Etheridge ends up getting into the Senate race there's really only one seat that's shaping up to be at all competitive next year, and that's Larry Kissell's. We'll likely do a poll on how folks think he's done in his first year sometime next month. The legislative numbers are more meaningful because there are probably somewhere in the neighborhood of a couple dozen seats that could be closely contested next year. A Republican takeover of the legislature is entirely possible in this climate. It just remains to be seen whether they'll be able to raise the money and recruit the candidates to take advantage of it. Democrats at the state level have often been able to weather bad years for the national party because of superior campaigns and fundraising. And of course the election is 13 months away. Six months ago it would have been almost unthinkable that Democratic prospects could decline so much in such a short period of time, and there is certainly a possibility that things will be much rosier for the party a year from now than they are today. Generations of North Carolinians and newcomers alike may take it for granted that the North Carolina Symphony has always been there, and always will be -- an assumption that ignores the fact of the symphony's fragile beginnings and its fragile finances that threaten its future. But the symphony story is worth telling and retelling as a reminder of how many good things in North Carolina are the result of a few individuals' inspiration and hard work that resulted in an institution that we can't imagine not existing. So when Maxine Swalin died last week at 106, it was an occasion to remark on how far the symphony has come since the days in the 1930s when she and her husband Benjamin Swalin, who taught in the music department at the University of North Carolina (decades before the legislature would rename it UNC Chapel Hill), took on the symphony as their personal project and campaigned for its survival. They reorganized the symphony, begun in 1932 but on the brink of oblivion, sold subscriptions to its performances one by one, traveled on intercity buses to promote its future, helped persuade the NC General Assembly in 1943 to pass the "horn tootin' bill" that gave the symphony annual financial support and over the decades built the symphony into a nationally known and acclaimed organization. The genius of the symphony, from a North Carolinian's point of view, is that it brought classical music into public schools from one end of the state to the other, playing in tiny auditoriums and drafty gyms and wherever its schedulers could find a place to introduce children to fine music. There are a number of blogposts where the Swalins are recognized for all they did (Benjamin Swalin died in 1989). Here's the symphony Web site's tribute. I particularly liked its last paragraph noting that the lobby of Raleigh's Meymandi Concert Hall is dedicated to the Swalins, and features a statue with these words by former Gov. Terry Sanford: "But for Ben Swalin, the North Carolina Symphony would not be. But for Maxine, Ben would not have prevailed. Bravo." Burr to avoid 'serious challenge' in 2010? The changing political environment could be helping Sen. Richard Burr (R-N.C.) avoid a serious challenge in 2010. Public Policy Polling, the Democratic-leaning firm based in North Carolina, just put out new numbers on Burr that show him leading a generic Democrat 45-34. Four months ago, Burr trailed that generic Democrat 41-38. Burr has also extended his lead over all of his potential Democratic opponents to double-digits, including leading Rep. Bob Etheridge (D-N.C.) 44-33 and Secretary of State Elaine Marshall 44-32. Marshall is in the race; Etheridge is weighing it. Burr's favorable numbers remain largely unchanged, so it doesn't appear to be anything that he's doing. But perhaps more than any other state that voted for President Obama last year, North Carolina is experiencing buyer's remorse. Obama's approval rating in the state has sunk from around 60 percent early this year to the mid-40s, with more North Carolinians disapproving of him than approving of him. Burr, who looked like one of the most vulnerable GOP incumbents at the beginning of the year, will likely remain a target because of his favorability numbers, but he's looking to be in better and better shape, and that could scare away someone like Etheridge. Voters in Wake County sent more than a message Tuesday when they overwhelmingly voted into office three opponents of Wake County School's diversity policy and advocates for more neighborhood schools. Voters also came close to putting a fourth critic of the existing policy into office, but there may be a runoff for that seat. One member of the board, Ron Margiotta, already opposes current policy. The overall impact of the election, so far, is that four members of the nine-member Wake County School Board will be advocates for more neighborhood schools, and potentially a fifth could be elected, giving the board a majority of change advocates. Deborah Prickett, Debra Goldman and Chris Malone won their races handily with margins averaging 22 percent over candidates favoring the current school assignment and busing policies, the News & Observer notes. In the fourth race at issue, change advocate John Tedesco got 49 percent of the vote; Cathy Pruitt, who considers herself a potential swing vote on the board if she were to call for a runoff and win the election, got 24 percent and incumbent Horace Tart, who loses his seat, got 23 percent. Wake County has long had a good reputation for its public schools, using busing and frequent student reassignments, among other policies, to maintain racial diversity at its schools. But many parents across the city have become increasingly concerned about assignment policies. That concern developed into strong interest in remaking the school board in this election. Both the local chamber of commerce and a number of local leaders, fearing a change to neighborhood schools would lead to re-segregation, tried late in the campaign to generate concern among other voters about keeping current policies in place, but public opinion polls ran strongly in the other direction. With a low turnout Tuesday of about 9 percent, advocates of change carried the day. Chris Fitzsimon, a former newsman, advisor to former House Speaker Dan Blue and now policy analyst and blogger for N.C. Policy Watch (www.ncpolicywatch.com) at the N.C. Justice Center in Raleigh, looks at some interesting numbers as voters in Wake County go to the polls today in an election that could change the county school system's diversity policy and require more neighborhood schools and less busing. 55.5- percent of African-American students in Charlotte-Mecklenburg Schools who graduate. 54.2-percent of students in Wake County Schools who receive free or reduced lunch who graduate. 17-percent that spending on busing by Charlotte Mecklenburg exceeded spending on busing by Wake County Schools in 2008-2009 school year. "As we head into fall Richard Burr's political position, though still somewhat precarious, is a lot better than it was at the beginning of the summer. "There has not been a major improvement in Burr's approval rating over that time. It was 34% in June and 38% in September. But tested against a generic Democrat he's gone from trailing 41-38 three months ago to leading 45-38 in our most recent survey, an overall shift of ten points in his direction. "His standing has improved not so much because of anything particular to him, but because the Republican base nationally and in North Carolina right now is considerably more fired up than the Democrats. "Some have pointed to the lack of clarity about the Democratic field as the major factor improving Burr's position, but Democrats are in the same position on that front as they were two years ago at this time so that's really not the issue. There's just been a significant shift toward the Republicans in the national political climate. If it should shift back by this time next year Burr will be just as vulnerable as he looked six months ago, regardless of who the Democratic nominee ends up being. "If Burr ultimately does become the first North Carolina Senator besides Jesse Helms to be reelected in more than 40 years, it will be quite a lesson about how important timing can be in determining whether someone's political career is successful or not. If Burr had been up for reelection in either 2006 or 2008 there is virtually no chance he would have been reelected given his approval numbers and how strongly Democratic the state voted in those years. But he made it to the Senate in one good election year for Republicans and it looks like he'll stand for reelection in another good one. I don't know that Burr is a better politician than Elizabeth Dole, Lauch Faircloth, Terry Sanford, or Robert Morgan- but he might have better luck than all of them."